Pull the tab up to easily break the seal and the CAP comes right off! MOCAP TCS Series Tear Tab Plastic Caps are designed to fit over threaded tubing, rods and fittings with straight threads. These plastic caps are ideal for use as shipping caps, end caps, pipe caps, product protection and thread protectors. Inner rings lock cap securely onto threads until the cap is removed by pulling the easy grip tab and breaking the seal. TCS Tear Tab Plastic Caps are available to fit 3/8-24 through 1-7/16-12 thread sizes. 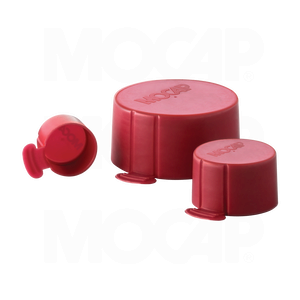 MOCAP also offers several additional product lines of tear tab plastic caps available to fit Metric, BSP and NPT Threads and fittings. MOCAP stocks Tear Tab Plastic Caps for Straight Threads in many sizes for immediate shipment. MOCAP now offers Micro-Pack and Mini-Pack quantities when less than case quantities are what you really need. To place an order, click the cart icon on the size chart. Or, to get more information about MOCAP products, call 800.633.6775 or use our Contact Request Form to receive information by e-mail.